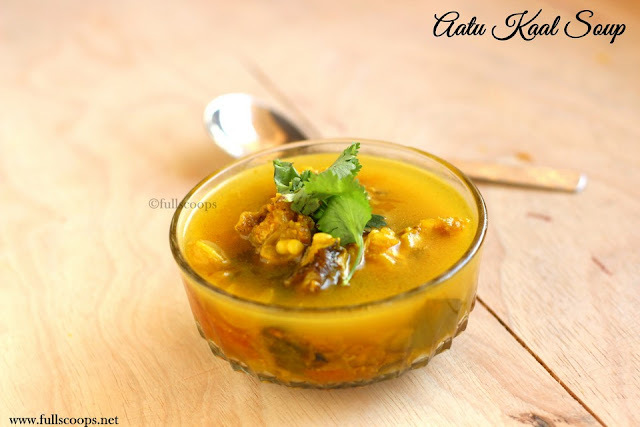 Aatu Kaal Soup | Lamb Leg Soup ~ Full Scoops - A food blog with easy,simple & tasty recipes! This is another healthy and delicious lamb that my mum makes. 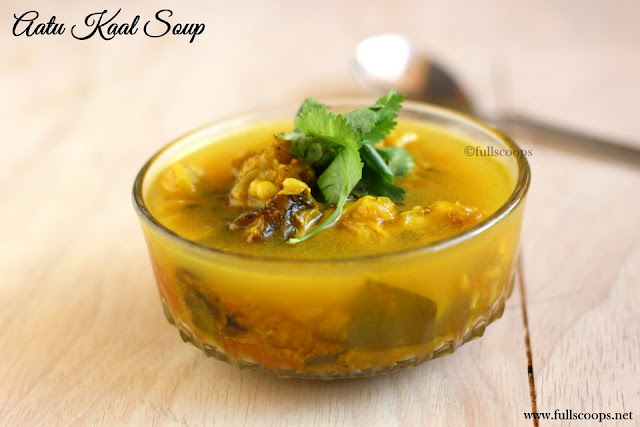 Apart from this soup she also makes aatu margandam soup and aatu kaal paaya. All these lamb soups are high in fat content hence very healthy for kids. 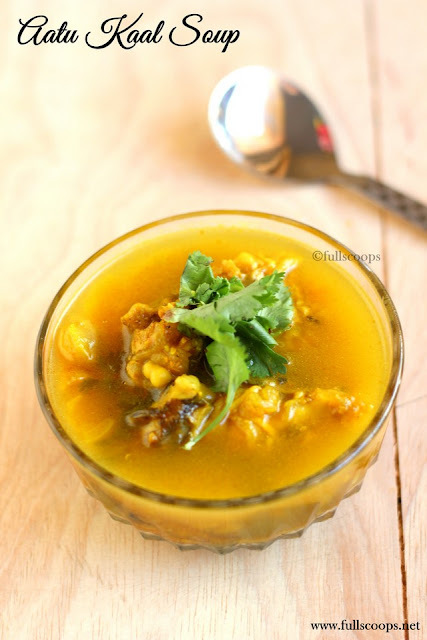 The adults in the family don't like to have this soup because of it's high fat content so we make this soup especially for the kids. My nephew likes to drink the soup as it is but my fussy kids don't drink soup so I mix with rice and give them soup rice! 1. Soak the aatu kaal in a bowl of water for about 15 mins. Then scrape all the black residue from the legs. 2. In a pressure cooker, add the legs, chop the shallots and tomatoes roughly and add it. Add the curry leaves, coriander leaves, ginger and garlic. 3. Add the masalas - cumin powder, turmeric powder, pepper powder and some salt. 4. Add the water and mix well. Pressure cook for 1 whistle on high and then simmer and leave for 5 whistles. 5. Once the pressure releases, open the cooker and serve hot. You can strain the soup and serve too. 1. Adjust the spice level if giving to kids. 2. You can add crushed pepper corns and cumin seeds too instead of the powders. 3. Sometimes I blend together 3 medium tomatoes, 1 tsp cumin seeds and a handful of coriander leaves. Add this mixture to the pressure cooker, add 1/4 tsp turmeric powder and 1/4 tsp fennel powder. Add 1-1.5 cups of water and add the lamb legs and salt. Pressure cook for about 6-7 whistles. Once done, open and strain, add a pinch of pepper powder and serve. Ah... with loads of pepper, this is just amazing! Healthy or non-healthy, I love this soup.